The measure's House sponsor vowed a legislative override of the veto, adding, "People are dying"
Illinois Gov. 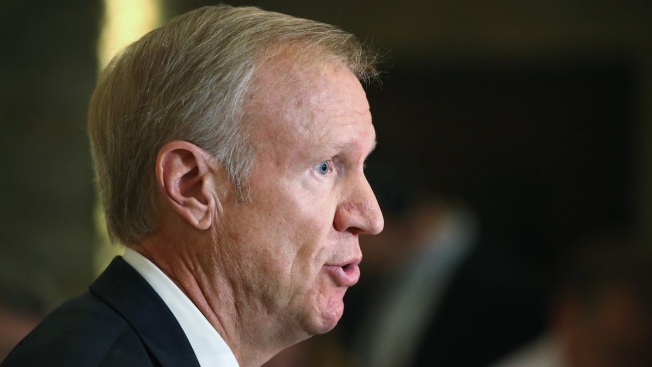 Bruce Rauner vetoed Monday critical pieces of a bill to intended fight heroin addiction and overdoses, saying that while he supports the measure in principle, the state can't afford it. The Republican governor used his amendatory veto power to remove a section from bipartisan legislation that requires Medicaid coverage of all heroin drug treatment, as well as anti-overdose and heroin-treatment medications. The measure's House sponsor vowed a legislative override of the veto, adding, "People are dying." The legislation, which passed with overwhelming support, also would require emergency authorities and school nurses to carry and administer medication that reverses overdoses, increase education for school kids and anyone taking prescription opioids, provide more treatment options and less jail time for users, and more. But in a state with a staggering deficit and still no agreement on a yearlong budget plan eight weeks into the new fiscal year, Rauner said Illinois can't pay for the entire package. "I support all of the above measures and applaud the multi-faceted approach to combating this epidemic in Illinois," Rauner said in his veto message. "Unfortunately, the bill also includes provisions that will impose a very costly mandate on the state's Medicaid providers." He scratched out wide Medicaid coverage for treatment and removed subsidized payment for methadone, a widely-used drug to treat recovering addicts, and the overdose-reversal drug that goes by the trade-name Narcan. House Deputy Majority Leader Lou Lang, a Democrat from Skokie, called the veto short-sighted. He complained that he sought figures from the administration for months about the cost of the plan. He's skeptical of the estimated annual price tag from the Department of Human Services — $15.4 million — and said no one counted the savings that would be realized by wresting addicts from heroin's control. "There's a human cost to not doing it: People are addicted, people are sick, people are dying," Lang said. "You want to talk about the costs of providing methadone and Narcan to addicts, but you forget totally that if you cure them or they get off the stuff, there's a savings to the Medicaid system on a different line item, because they're no longer in emergency rooms, they're no longer a burden to law enforcement." Lang added that Rauner never suggested alternatives that would lessen the plan's financial impact. Rauner spokeswoman Catherine Kelly pointed to the governor's message that he supports the idea and hopes Lang "will accept the governor's changes and move forward." The House endorsed the plan 114-0; the Senate, 46-4. Lang said he would press for reversal of the veto. A three-fifths vote to override in each House — 71 tallies in the House, 36 in the Senate — would restore the funding. Roosevelt University released a study this month showing that Illinois' addiction-treatment capacity fell from 28th in the nation five years ago to third worst. One-quarter of state-funded treatment admissions in Illinois, 35 percent in Chicago and its surrounding counties, are for heroin addiction, compared with 16 percent nationally. Lead author Kathleen Kane-Willis, director of the Illinois Consortium on Drug Policy, said Illinois is one of the few states in the nation that doesn't allow Medicaid coverage of addiction treatment with methadone, a proven, effective drug that's cheaper than counterparts.